“LEFT-WING PROPAGANDA MACHINE”: WATCH MY 2015 SHOW… FOR FREE! 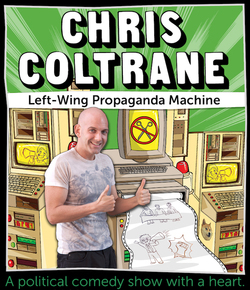 LEFT-WING PROPAGANDA MACHINE was my 2015 stand-up show. It’s a show I wrote shortly after the Tories won the election. I wanted to make something that would show that even though Cameron won, it doesn’t mean that everyone has suddenly lose their compassion. There is still hope, and we should never give up fighting. I talk about where Labour went wrong, whether the Greens can be trusted, and whether we even live in a democracy any more. I talk about how I’d like a more evidence-based drugs law, about fighting pseudoscience at chocolate conventions, and almost inevitably, Nigel Farage. There’s really something for everyone, apart from people who are awful. ​​It’s packed full of jokes and fun, and if I’ve done my job right, it’ll leave you feeling warm and fuzzy. Give it 66 minutes of your time, and I’ll give you The Good Times™. If you want to stream it for free, you can watch it over on YouTube! Check out the video below. If you’d rather own the actual video file, drop me a donation over on my Donate page with a note saying you’d like it. Donate whatever you like! £2 if you’re poor, £20 if you’re rich, or more, or less! It all goes to supporting my work, and helping me to make more of that sweet sweet comedy you love. Here’s a fun interview I did with Laugh Out London! And here’s another one that I did for the British Comedy Guide!